Previously Symantec claimed that Android is not more secure than iOS and now Anti-Virus maker McAfee have reported that iOS devices which include iPhone,iPod,and iPad still remain unaffected with the growing Malware attacks and viruses as compared to Android. 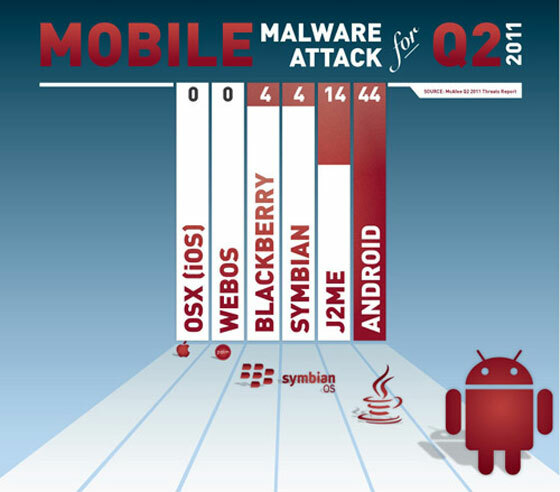 The above is the chart of Q2 of 2011 which shows that iOS and Web OS got 0% Malware attacks as compared to Android which got 44% and the number of Maware is increasing time to time. The difference seems largely explained by how Apple runs their platform — as a closed, closely inspected garden that makes it far more difficult for malicious apps to make it into the App Store and through to consumers. Google, meanwhile, has a far more open ecosystem that allows far more types of apps in the Market, including some that ought not be allowed. In other words Android is getting more Malware attacks and Viruses is because Android is an open platform to Developers, so some hackers miss use this opportunity and make typical viruses like well known Applications. Where as iOS is closed source and to get development on iOS you need to purchase the Developers Account from Apple.